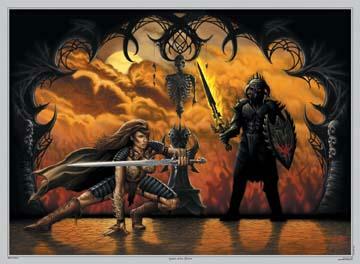 From a world of fantasy legends come the sixth edition of the "Swords of the Ancients Collection" , designed by fantasy artist Kit Rae , Valermos "Sword of Fire". 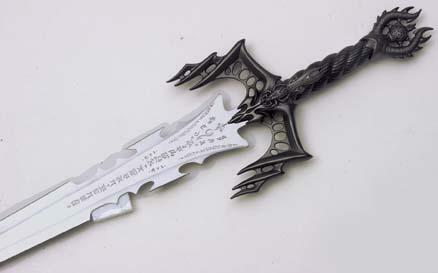 This high quality fantasy sword features intricately detailed solid metal handle parts and 420 stainless steel blades engraved with ancient runes. Each purchase includes a FREE full-color 18" x 24 1/2" art print , "Battle at the Tower" and a new chapter in The Tale of the Swords of the Ancients , printed on parchment paper. Each piece is branded with the designer's trademark. Handle Material: Cast metal guard and pommel , antique iron finish , simulated black ivory grip , rat-tail tang construction. Beware of Imitations , Counterfeits and Knockoffs !